Now, it is far from easy to agree when we set out to pick the 10 coolest and most beautiful shirts of the summer; some would say it is impossible. Non the less, we have taken a good look at all of the new shirts that have come in at our warehouse for the summer, to select the top scorers and the most beautiful shirts that we will lay our eyes on in the coming season. As you may have guessed, this little mission led to some rather outspoken debates here at the Unisportstore Headquarters, but now things have settled down a little and we have a result to show you all. Adidas - Real Madrid Away shirt 13/14 Kings are expected to dress to impress. And they have done just that. 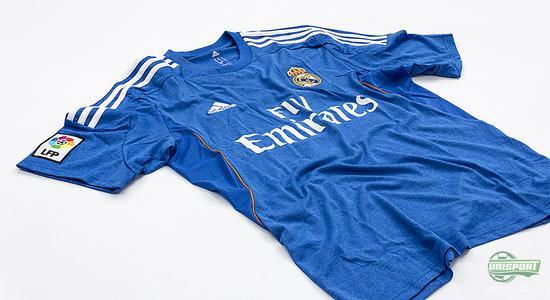 Adidas and Real Madrid have created a royal blue shirt that is just stunning, and certainly a king club worthy. Real Madrid, as a club, certainly splits the crowd, there is no arguing that we are talking elegance in display when Cristiano Ronaldo, Isco and the other stars pull on this shirt. We were already looking forward to seeing what Carlo Ancelotti can get out of Madrid in the coming season, and a shirt like this certainly doesn't lower the expectations. Do you feel like a king, and are you looking to get the king club's new away shirt, here is where you wanna go  prices from 51. 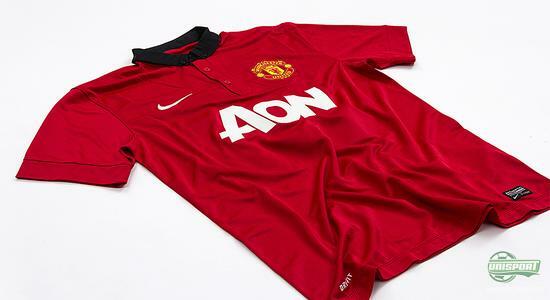 Nike - Manchester United home shirt 13/14 If there is one shirt, sure to be expected and awaited more than most, it is The Red Devils'. An English champion club needs to sport a proper attire, and it is safe to say that United have hit a home run for the new season. At first glance the shirt may not look all that special, but the minimalistic simplicity and elegant style is a sure winner. And with a nice detail like the Gingham checks in the collar to celebrate the club's roots, we put our hands together  nice work! If you are looking to get the new Manchester United shirt, this is where you wanna look  prices from 58. 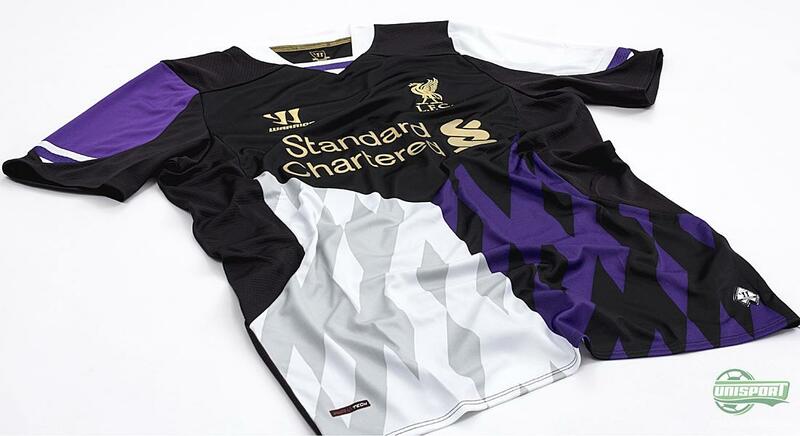 Warrior Sports - Liverpool FC third shirt 13/14 This is a true crowd splitter, either you love it or you hate it. There have been doubts here at the offices and great debate, but in the end we have to admit this is both a creative and innovative beauty to be added to the Liverpool wardrobe. The colours manage to stand out, Warrior Sports are clearly not afraid to be creative as we see with the white, black and purple colours. The shirt is certainly not for the very conservative, but we believe that a lot of Liverpool fans are more than satisfied with eye catching new shirt. 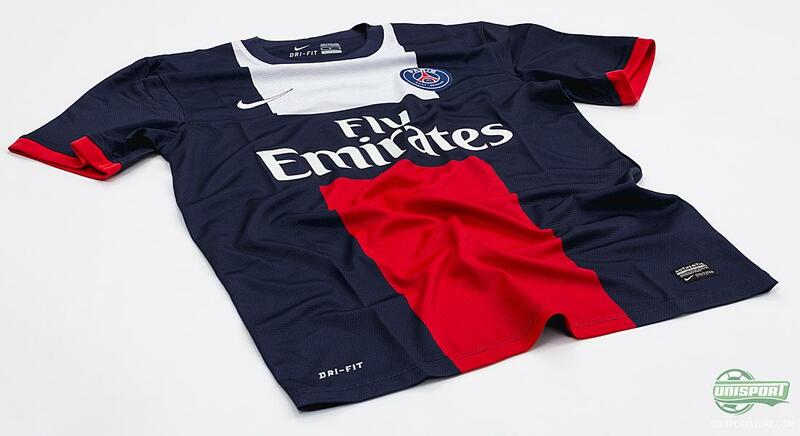 Nike - Paris Saint-Germain home shirt 13/14 A team that we are going to follow with special care in the coming season is PSG. Not only do the French look to be able to participate in the battle for Champions League title, but the team also has a shirt that even the critical fashion designers of Paris can only appreciate. The home shirt from Nike is elegant, stylish and displays the club's classic blue, red and white colours. And whether you hope that Laurent Blanc can lead Zlatan, Thiago Silva and the other to glory or not, you have to appreciate the aesthetics of this complete an elegant shirt. Would you like to own the Paris Saint-Germain home shirt, here's where you wanna go  prices from 58. Adidas - AC Milan third shirt 13/14 If you have a proper golden shirt, then you more or less have reserved a spot on this list already. 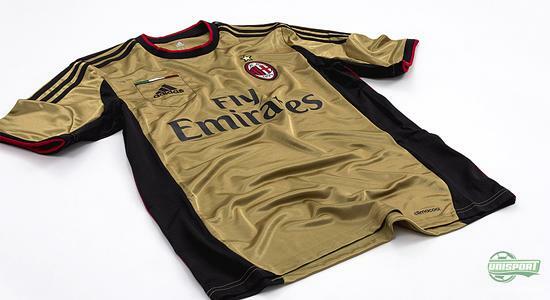 And with an elegant shirt with nice detailing like the new Milan third shirt you're in. It requires a certain amount of confidence to make a golden shirt before you have won the championship, But Milan and Adidas don't seem to have been hesitant at all. When taking a look at the shirt you will see the Classic Milan logo, as well as a chest pocket with the Italian flag on the inside. It's Italian, it's AC Milan, and it just works, don't question how. Are you getting the new AC Milan third shirt, here is where you go  prices from 64. Puma - Dortmund home shirt 13/14 They were disappointed, yet the Dortmund players have plenty of reason to be very proud of the performance they delivered as they, last season, made it all the way to the Champions League final, which they lost. Since the disappointment in May, the Ruhr district club are now back on track and ready to take to the pitch in their new home shirt. They are facing a tough challenge as they will battle the mighty Bayern Munich; but for now, they have definitely been equipped with a winner shirt from Puma. The shirt has an elegant design with the black club colours, as well as a modern dynamic design. 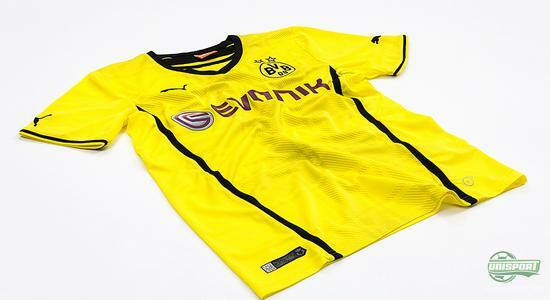 It is going to be very exciting to see what Dortmund can deliver in the coming season and also to follow the new shirt. 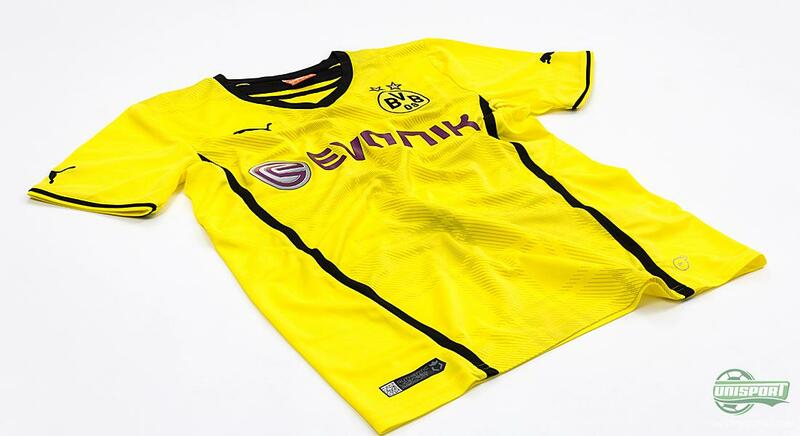 If you would like to get your hands on the new Dortmund home shirt, check it out right here  prices from 51. Macron - Lazio third shirt 13/14 Some football shirts just look good, and the new Lazio third shirt is definitely in the category. The shirt is created by Italian Macron, who have taken the the club's classic sky blue colour and used it in the shirt in the form of little stripes that break the clean and darker blue colour. The result speaks for itself, and the shirt made it into the top 10 despite the fierce competition. 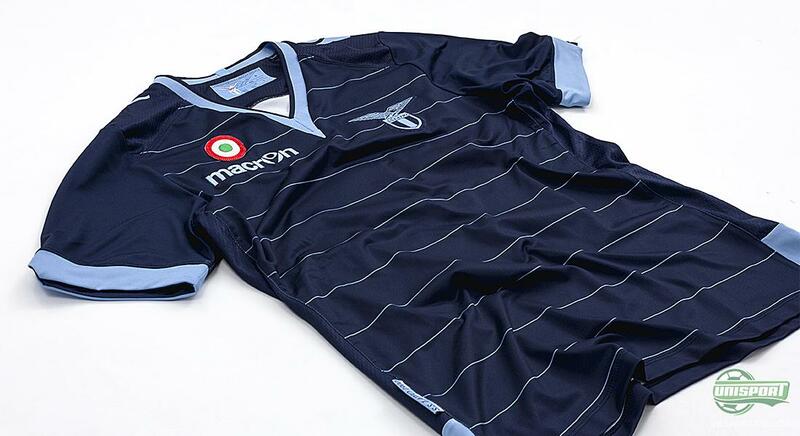 Are you also finding the Lazio third shirt very elegant, you can find it right here  prices from 77. 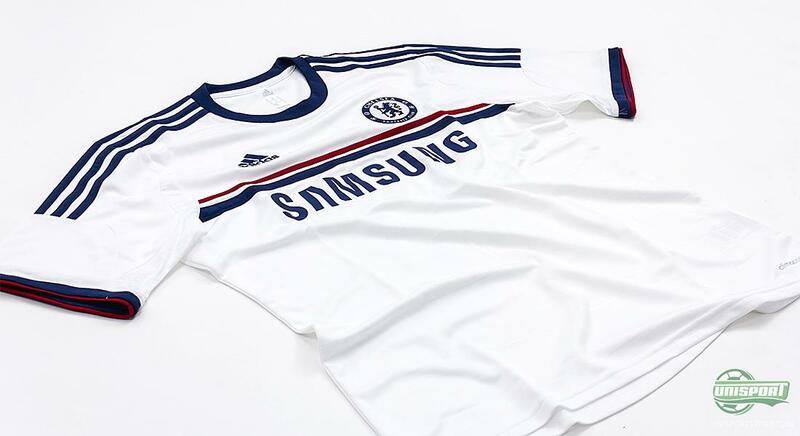 Adidas - Chelsea away shirt 13/14 White shirts are known to carry a certain aura, and the new Chelsea away shirt truly displays elegance and style. The London club's new shirt is not only made of the top quality and sweat wicking Clima Cool material, and it also very easy on the eye, with the club's classic blue collar running down the sleeves and across the stomach. The shirt is minimalistic, and it is still working here in 2013, and the (the blues) away shirt makes it into our top 10. Are you a Chelsea fan and are you looking to getting the club's latest shirt for your collection, then come along right here  prices from 51. Adidas - Ajax away shirt 13/14 It's hard not to like the new Ajax away shirt with with the elegant black and pink combinations, a refreshing choice. And since we are based in Denmark, and Ajax have numerous Danish players, it's not hard to imagine that people here are very excited about this shirt. Not many clubs would have the guts to go with a pink colour, but when it happens, you get a spot in our top 10. Are you looking to get the new Ajax away shirt, come along  prices from 64. Nike - Barcelona away shirt 13/14 To end off the show we have kept a sure winner, and a very popular choice. 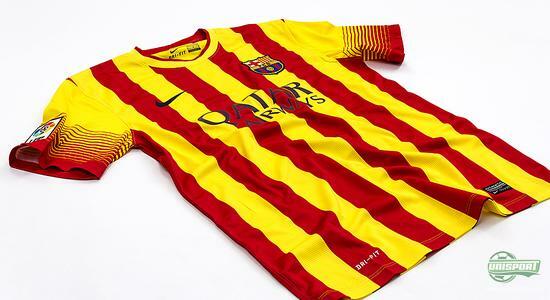 Barcelona are known to be very proud of the club's Catalonian roots, and this has resulted in an elegant striped shirt with the Catalonian colours. The colours are not only summery and colourway, they also manage to display themselves more than well on a football pitch, which is why we had to include the shirt in this top 10. If you support Barcelona, you can get the club's new shirt right here  prices from 58. So, that's how you fill up your wardrobe with 10 of the summers most elegant, daring, classic, as well as modern shirts in more or less every colourway known to man. It has, although, been more than hard to decide on which shirts to include in our top 10, and there might still be one or two colleagues who are not fully satisfied with the result. If you would like to make your very own top 10, then you can go to our club shop site right here, and get the full overview of all the new shirts that have been launched, including the once we are still waiting for. True to custom, the summer has brought us a whole lot of new shirts, and here at the offices we are very excited about all the new shirts that have been presented to us. What do you think of the new shirts for the upcoming season? Do you have a personal favourite? As always, please feel free to leave us a comment, either here or on Facebook and Twitter.